Many members of Illinois' Congressional delegation offered their thoughts on last night's State of the Union speech. 16th District Republican Adam Kinzinger held a conference call with reporters. 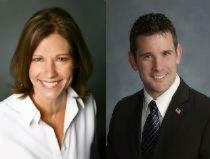 17th District Democrat Cheri Bustos issued a statement immediately following the address. Kinzinger says President Obama descended into more partisan rhetoric. He also says the speech failed to include a concrete proposal to avoid automatic spending cuts. "He's the leader of the free world. He's frankly the leader of the legislative process. He needs to come to the table with a proposal [so that] we can come back with some options" Kinzinger told reporters. Kinzinger added that he's concerned about the President’s proposed defense cuts. He says they would debilitate the U.S. military and make it extremely difficult to respond to threats in the coming years. The Republican did agree with Mr. Obama on some of his comments regarding immigration reform, including a streamlining of the application process. “I’m encouraged that President Obama focused on the number one issue I hear about when I travel around our region, and that is creating jobs and strengthening the middle class. “It is why I invited Dot Turner, a laid off worker from Sensata in Freeport whose job of 43 years was shipped overseas after she was forced to train her Chinese replacement, to be my guest tonight. “I know we can do better. We need to encourage companies to create jobs here at home, not ship them overseas. We need to give workers the tools they need to succeed, not give them more pink slips.